The Indy Pinnacle offers exceptional comfort, efficiency and luxury. As the narrowest stair lift on the market, the Indy Pinnacle extends a mere 11” from your wall when installed. If you’re looking for an affordable, compact option that has top of the line safety features the Indy Pinnacle is for you. Manufactured in the USA by Harmar, The Indy Pinnacle features the patented helical drive system, making every trip smooth and comfortable. 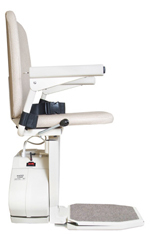 With the ability to lift 350 lbs, this easy to operate stair lift can operate during power outages for up to 40 trips. Safety features of the Indy Pinnacle include sensors that stop the stair lift when it meets an obstruction and indicator lights that are easy to read and operate. The Indy Pinnacle’s seat is adjustable for height and swivels at the upper landing for a safe and simple exit and entry. Safety sensors will always stop the lift when it meets an obstruction. 11″ wide – the narrowest stair lift available. Able to make up to 40 trips during a power outage. Entire system weighs 180 lbs, including the 16 feet of track! Indicator lights provide an easy operating system. Does not require grease or lubricants. Should you simply give up climbing a narrow stairway because too many stairlifts are too wide? 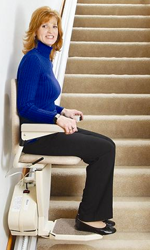 Let the Indy Pinnacle Stair Lift take you from one floor to another with ease. The narrowest stair lift available, the Pinnacle is only 11 inches away from the wall and is made with top safety features and a helical drive system. Don’t worry about a cramped design or getting stuck when using the Indy Pinnacle. 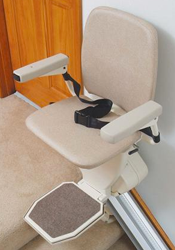 As a narrow stair lift, the Indy Pinnacle supports up to 350 pounds, offers an adjustable swivel seat, operates during power outages, and features a sensor and indicator light. Our Indy Pinnacle Stair Lift is the apex of convenience; increase accessibility in your home regardless of stairway size.